Beyond all doubt, it is essential to have a good understanding of the Transaction Log (T-Log) so that we can diagnose unforeseen performance issues related to it and I am sure that almost everyone had at least one. The T-Log is basically a record of all transactions happening to the database. All these transactions are actually first written to the physical T-Log file, and then after a CHECKPOINT, is written to the Data File via the Lazy Writer process. Some of the uses of T-Log are: as a point in time recovery (full recovery model), to record the Start and End of each transaction, every data modification (insert, update, delete) including system SP's, DDL statements to any table including system tables, every extent and page allocation and de-allocation operation, and creation or drop of tables and indexes. More specifically, SQL Server uses a Write-Ahead Log Algorithm whereby the Log Buffer Manager always guarantees to write the change descriptions (log records) to the T-Log on disk before it writes the changed data pages to the physical Data Files. Furthermore, Write Ahead Logging also allows SQL Server to ensure some of the ACID properties of database transactions, most significantly durability. 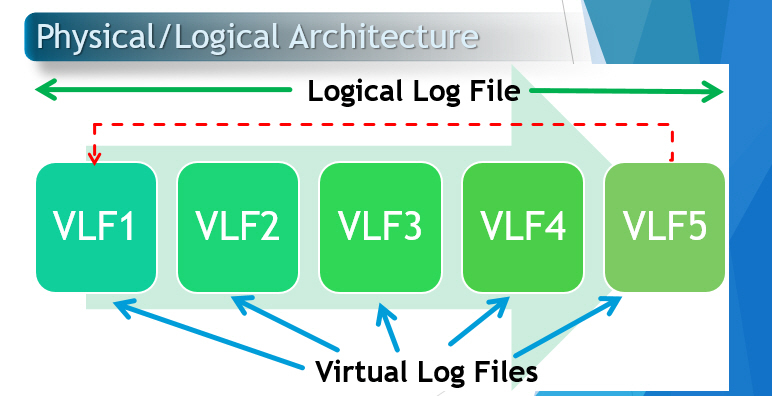 It is of paramount importance to keep in mind that there is no performance benefit from having multiple physical log files for the T-Log because it is written sequentially and in a round-robin fashion. Sometimes, we can have many T-Log files for a database as long as there is no enough space on the partition disk, so we can add one more T-Log file on another partition disk so that SQL Server does not stop working until the final solution is provided. 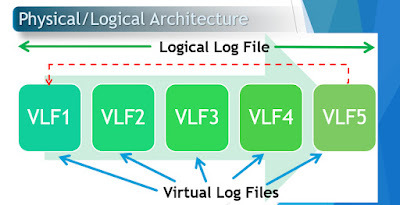 Instead of having various T-Log files, it is highly advisable to work on preventive actions to optimise the T-Log file usage in terms of performance and availability, for instance, make sure only one Log File is used, use a dedicated drive/array for the T-Log file (use RAID 10 for log drives, if possible. RAID 1 is also acceptable), avoid Log Fragmentation (avoid frequent small auto-grow events, set 2GB, 4GB or 8GB auto-grows for example), Fragmented Log File can slow down the performance of operations that read the T-Log file such as Backup Tasks, Crash Recovery Process, Database start up, Transactional Replication, Database Mirroring, creation of a Database Snapshot, DBBC CHECKDB, DBCC LOGINFO, Change Data Capture, etc. So, how can we control the size of the T-Log File? it depends on the database recovery model, in other words, with SIMPLE recovery model: SQL Server auto-truncates and reuse the space after committing the transaction whereas with either FULL or BULK_LOGGED recovery model, a Log Backup is the only action that can truncate the T-Log, nevertheless, you might have seen that after taking Log Backup, the Log space was not truncated yet, this is because some internal T-Log records may still be required by some other database operations like Open transaction, AlwaysOn AG, Replication, CDC, Mirroring, Backup, etc. It is well worth noting that we must try to keep VLF's as less as possible and each VLF of an acceptable size because the more you have the worse the performance will be. I recommend having VLFs of no more of 512MB per one, but it depends entirely on the use of the T-Log file and its growth settings. Internally, SQL Server divides a Transaction Log file into a number of sections called Virtual Log Files (VLFs). By default, a T-Log will have 4 VLF's when created. After that, the next VLF's will get individually created with each auto grow or manual grow. Here is the base on what SQL Server starts creating the next VLF's: < 64MB = 4VLF's // >= 64MB < 1GB = 8 VLF's // > 1GB = 16VLF's. In SQL2014, 8MB <= 1VLF. Finally, if we need to figure out how many VLF's are, we can use the command DBCC LOGINFO which is an undocumented command but is safe to run because it just reads the T-Log, and the most important columns to look for are the following: FileSize (VLF size in bytes), Status (0 Not in use, 2 In use), CreateLSN - it can be used to determine how many VLF’s were created in a log file growth operation, that may be 4, 8 or 16, and this also indicates the Log Sequence Number. That is all for now, taking this insight into consideration will stand you in good stead for when you have to fix some internal T-Log issues. Thanks for reading. Let me know any remarks you may have. Stay tuned. Clearly, it is of paramount importance to monitor the state of statistics because they always play a significant role on the performance of the whole database. When statistics are not up to date the performance will indeed decrease tremendously over time and I am sure nobody wants to have a sluggish system. How many times did you find yourself in a big problem related to unforeseen performance issues even some days after having carried out dutifully the respective database maintenance tasks? did you wonder why rebuilding index and statistics update tasks are not being good enough? if everything was working smoothly, why did the performance start going down unexpectedly? Why are the indexes not being used as usual? do I need to create more indexes? the answer might be found by digging deeper into the stale statistics. It is worth noting that Statistics contain all the information that SQL Optimizer needs to generate the best possible execution plans for your queries. If they are not up to date then the impact might be disastrous. So, having the right indexes are not good enough when the statistics went stale. Generally, it is advisable to update statistics if it is verified that at least 20 per cent of the data changed (as long as they have more than five hundred rows). But can we know how many rows changed for a table so that we can just update its Index Statistics? In SQL Server almost everything can be checked and this is not an exception. Today I an coming with a script to check which Index Statistics have gone stale so that we can focus our work on them and keep expected performance going as well. The script is built on the base of STATS_DATE function which retuns the date of the most recent update for statistics on a table or indexed view. Bearing in mind there are two types of statistics: Column Statistics and Index Statistics. The first type are statistics linked to columns and created automatically as result of querying the columns, so SQL Server normally creates them unless you have AUTO_CREATE_STATISTICS database option disable, whereas the second one are statistics linked to indexes and these statistics are created at the same time when the indexes are. Likewise, Index Statistics are always updated with FULLSCAN while indexes are being rebuilt. So, there is no need to update Index Statistics explicitly after rebuilding the indexes, if so, it might be harmful because UPDATE STATISTICS command without pamareters is based on default sampling and it is not the best option for the vast majority of cases. Talking of a little more of Column Statistics, after rebuilding indexes we just have to update Column Statistics and for this case it might be good enough to use default sampling, however, it is also advisable to use FULLSCAN if your environment is worthy of it. Many of us may be wondering how many times the statistics need to be updated per month? the answer depends entirely on how frequently your data is being changed (updated, inserted, deleted). Updating statistics once a week might be enough for highly transactional environments whereas for others once a month would be more than good. That is all for now, I hope you find the script helpful. Le me know any remarks you may have. Stay tuned.